We would love for YOU and your family and friends to join us for our first movie of the summer! We are doing a fun throwback to 1991! Hook is based on the classic Peter Pan story. It's filled with adventure for all ages! Steven Spielberg's 1991 venture follows grown-up Peter Pan (Robin Williams) as he returns to Neverland. Now a hardworking lawyer with three kids and a troubled marriage, Peter heads to London with his brood to visit Granny Wendy (Maggie Smith). 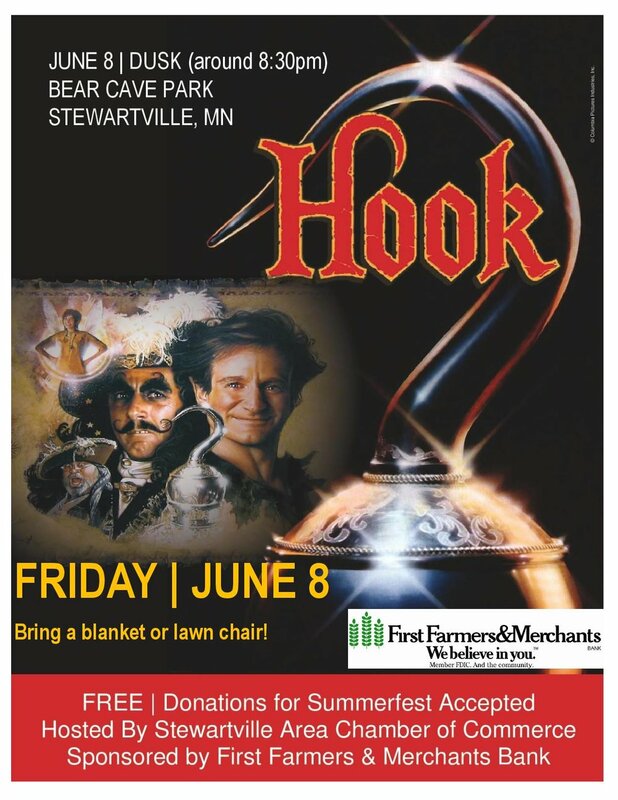 Peter is thrown back to his past when Captain HOOK (Dustin Hoffman) kidnaps his kids. With help from Tinkerbell (Julia Roberts), middle-aged Peter regains his memory of who he really is (and how to fly) and sets off to Neverland to rescue his children and do battle with his arch nemesis, Captain Hook. Movie is sponsored by First Farmers & Merchants Bank. We would love for YOU and your family and friends to join us for our second movie of the summer! Bring your favorite lawn chair or blanket to curl up under the stars! We are going to SUMMER CAMP and celebrating FAMILY with this movie! Two identical twin sisters, separated at birth by their parents' divorce, are reunited years later at a summer camp, where they scheme to bring their parents back together. The girls, one of whom has been living with their mother and the other with their father, switch places after camp and go to work on their plan, the first objective being to scare off a gold-digger pursuing their father.